The little campsite at Bosméléac lake is a peaceful holiday haven surrounded by nature, and is a great base for fishing and walking. The modestly-sized Camping du Lac de Bosméléac has 25 pitches for tents and caravans and five well-equipped wooden chalets. 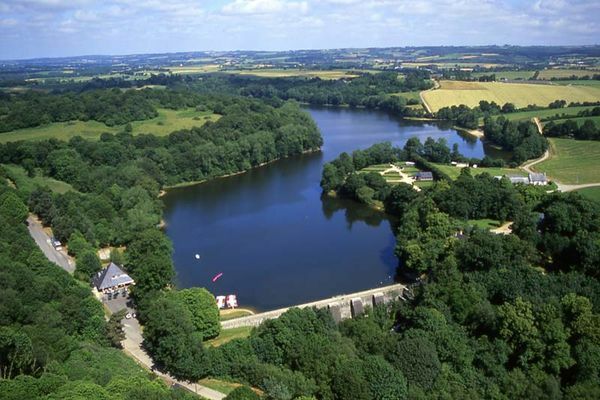 The site is in a peaceful woodland setting and overlooks the 3km long Bosméléac lake which feeds into the Rigole d’Hilvern, an artificial water channel linked to the Nantes-Brest canal. You can walk round the lake or hire a bike or pedalo from the site. The area is known for its predator fish and whitefish, many of them well-sized. The campsite crêperie is a popular place to stop after a trip out by barge or mountain-bike. The delightful towns of Quintin and Moncontour are just a few kilometres away and provide a great insight into the historical heritage of Central Brittany.